Eye tumours do not necessarily have to be malignant (meaning cancerous) as it is possible to develop benign types too. Benign tumours can include dermoid type cysts that can appear on the eyelids and eye margins; however, it is not limited. These can grow to obstruct vision and cause some unpleasant symptoms and may or may not need treating depending on their severity. There are several forms of eye tumour that can occur in adults, some affect the inside of the eye itself, whilst others affect the eyelids. The most frequently seen tumour inside the eye (otherwise known as intraocular), is called uveal melanoma. They can attack the uvea which is made up of the iris, the choroid, or the ciliary body. 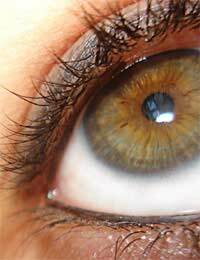 As they are a melanoma, they develop from the cells that give our eyes their pigment (or colour). The treatment for these types of eye tumours depend on the size, the anatomy involved and the health of the patient but it may require removal of the eye to ensure that all cancerous cells have been removed which is needed to preserve life. Other common adult cancers that affect the eyes are a form of skin cancer called basal cell carcinoma and squamous cell carcinoma. These tumours affect the eyelids and although they don’t often pose a threat of spreading very quickly if at all, can grow quickly and cause some nasty symptoms that will need treating. The most common form of cancerous eye tumour in children is called retinoblastoma. Early detection is essential in preventing this form of tumour causing long term damage of spreading to other sites and if it is caught early enough, a successful recovery is hopeful. As the title suggests, retinoblastoma affects the cells of the retina which is the part of the eye that receives and interprets light and sends the information to the brain via the optic nerve. There are two forms of this type of tumour; one is related to genetics whilst the other may occur as a single event in a family. Although it can affect both eyes, it is much more common to discover a tumour in one eye alone. This can contribute to the type of treatment used to fight the tumour, along with size, general health of the child and its exact location. Eye cancer symptoms can go unnoticed in many cases, at least until the growth is large enough to be causing problems with sight due to the size. It may however be noticed if a dark spot has appeared in the eye or the white of the eye or if there appears to be a haze of colour (often with a yellow tinge) across the eye itself. Regular eye tests are essential for early intervention of any eye problems and making sure you protect your eyes from the sun can help lower the chances of developing some forms of cancer. If you have noticed any changes to your sight, are experiencing watery eyes for no apparent reason, have noticed any spots in the eye, have any visual disturbances or any growths around your eyes, please see your doctor or optician to have these complaints assessed.